Did you know that in the mid-nineteen-seventies there was another superhero named the Flash? He didn’t have the same powers though! No. Unfortunately not! He just had a long, brown, dirty trench coat, and the ability to shock! Want to know more? Then please don’t read the following adventure created by Joshua Williamson, Howard Porter, and published by DC Comics in August, 2018. TO QUOTE Helen Rowland Love: 'When a man falls in love his heart is either exceeding the speed limit or getting parked in the wrong place'. 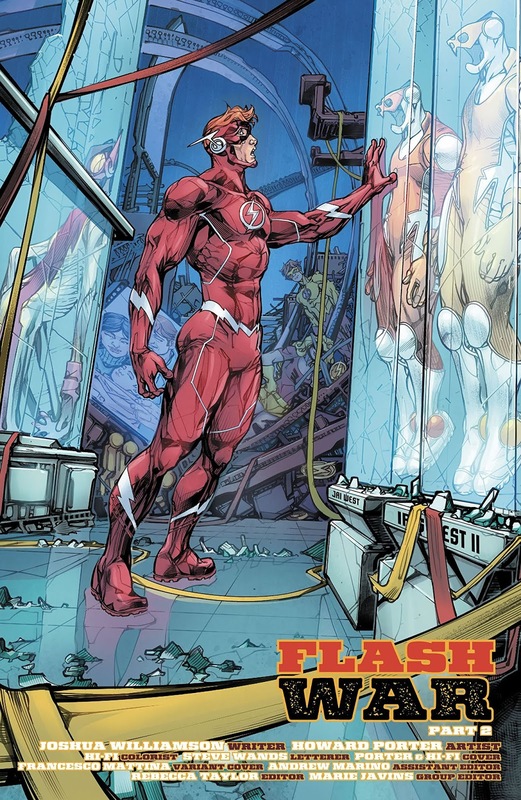 A few years ago, Barry Allen mistakenly altered the entire universe when he traveled back in time in order to prevent his mother from being killed by the Reverse Flash. 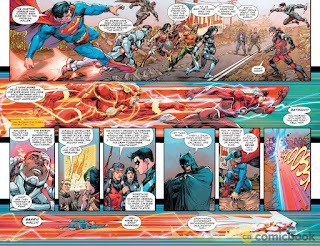 Don’t worry though, because he did manage to undo some of these alterations — please note, I did say ‘some’ — which unfortunately didn’t include the preservation of Irey and Jai West, the children of Wally West and Linda Park, who are now stuck in the time-stream with no way of getting home. 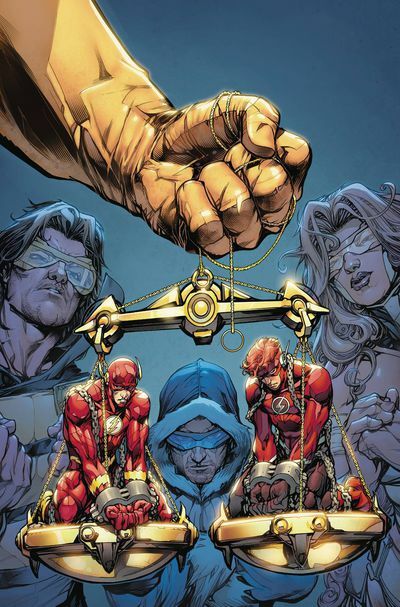 Although, that said, according to Hunter Zolomon, otherwise known as the villain, Zoom, there is one way of saving them, and that involves Wally breaking the time-stream like a fragile, little, twig, despite the fact that his actions could possibly disconnect everyone who shares a bond with it, be it Barry, his children, himself, as well as anyone else who rides the lightning, like Wallace West, for example. So that is why Barry runs after Wally to prevent this tragedy from taking place. 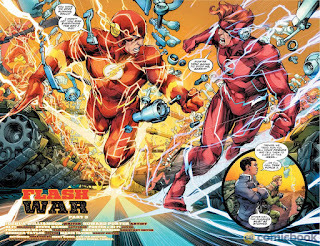 Part One) COMMON GROUND: After checking out the message boards I’ve noticed that some of you are complaining about the current ‘Flash War’ storyline. ‘It’s an excuse’, some of you are saying, a big longwinded excuse, just so we can all finally find out who would win in a battle between Wally West and Barry Allen. Which, I must admit, makes some sense, up to a point, because a large portion of this plot does revolve around one simple question: Who would win out of these two, either in a race or in a battle? Having said that, though, I would still like to stress that Joshua Williamson does politely pose this question in a very poignant fashion, doing so by giving both men a fair amount of relevant motivation -- and emotional depth -- so they can justify their particular side of the argument. 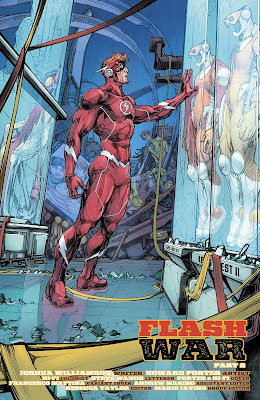 In Wally‘s case, he wants to save his children and bring them into our post Rebirth era. Whereas in Barry‘s case, he wants to prevent Wally from making the same mistakes he made during the ‘Flashpoint’ saga. Which, if you think about it, does come across as sounding fairly logical, completely relatable, and very understandable too, regardless of what side of the battle you wish to fall on! After all, if you’re a parent, I’m sure you would want to protect your children from serious bodily harm. Whereas if you're a friend, a sibling, or a work colleague, I’m sure you would want to safeguard your associates from repeating the same mistakes you’ve made! Come to think of it, it’s precisely due to this notion, this relatable two-sided rivalry, which makes this adventure even more enjoyable to read -- all because it presents us with something we can all connect with and relate to where motivation is concerned. What do you think, dear reader? Whose side of the battle are you clicking with more? Barry’s side or Wally’s side? Personally, I’m sitting on the fence with this one. Although, to some extent, I can empathize with both parties: Wally, for wanting to protect his kids, and Barry, for wanting to prevent any long-term ramifications. Saying so while keeping in mind that this scenario was manufactured, manipulated, and set up by Zoom, who is currently using their battle for his own ends (more on that point later). Part Two) CASTING THE BLAME: ... I wasn’t a big fan of how Wally was so easily manipulated! Seriously, why would Joshua want to dilute his personality and transform him into a tool, a patsy, for a villain to use, coerce, and control! Tonally it felt very forced, exaggerated even, and in a strange way reminded me of how DC Comics constantly manipulated Hal Jordan back in the day. First they cast him into the villainous role of Parallax (which didn’t work), then they transformed him into the new Spectre (ditto), and finally they reverted him back to being Green Lantern again (phew), doing so while trying to brush the whole ordeal under the rug, so to speak. So please, let’s hope they don’t make the same mistake with Wally! Make him into a slacker, make him into a father, or make him into a promising second-in-command. But please, for crying out loud, don’t transform him into a pseudo bad guy because nobody would ever accept it or believe it. No. Nobody at all! Another aspect featured in this adventure I wasn’t buying into was how... uhhh... wait a minute! How can I phrase this without spoiling the surprise? Although, to be fair, it wasn’t much of a surprise, or a revelation, for that matter, when it was finally revealed that Zoom was the main villain behind this piece! If anything, it was fairly obvious he was up to no good just by the way he acted and behaved. But what we didn’t know, Flash fans, was how his final gambit would ultimately play out! Basically, when Wally did, well, you know, what he had to do, Bang-Ting-Bing, this resulted in Zoom getting his powers back and becoming so powerful, so fast, that he was able to overpower every single hero in a blink of an eye, Blink!, all except for Wally and Barry, of course. I mean, really? Why do something like that so brashly? Why not give his re-introduction a bit more depth? Or at the very least, have some of these heroes put up a bit of a fight? Clark and Diana perhaps? I wasn’t that keen on the way Bruce was tossed around either. Yes, we know that Zoom is a badass villain, and yes, we know that his powers have been upgraded to the max. But, why-oh-why-oh-why, not show us his transition, visually, not textually, just so we can see how his powers gradually kicked in? It was as if his transformation took place behind-the-scenes, so to speak, and what we saw was simply the final result! Which, if you think about it, makes the whole ordeal seem somewhat anti-climactic, plot-wise, especially for a penultimate chapter! To some extent, I wasn’t quite sure about that strange 'force' revelation either, the one where we found out that ‘the force’ has a wider range of powers than we knew before. The speed-force is one thing, for sure, but to have a sage-force, a strength-force, and a God-knows-what-else force, kind of makes this power source appear too vast and less specific, almost as if this is The Flash version of the Green Lantern color spectrum. Also, before I forget, what about what happened in the 25th century? That was a surprise, I can tell you; a surprise which I'm sure will be resolved soon! Fingers crossed. 1) The man can really draw a magnificent splash page. Go on, take a look at those provided and see for yourself how much energy and excitement he can bring to the table. I personally love how he composes a wide, cinematic, frame, and sets the stage in a bold and lively manner that is easy to see and even easier to follow. 2) Talking about things being easy, yes, that’s right, this is another positive quality Howard has tucked up his sleeve. After all, if a story is easy to follow and understand on a visual level, then we, the readers, will also feel a certain amount of comfort and engage with it on a personal and emotional level. 3) Coincidentally, Howard is really good at drawing emotion too, and I just love the way he can make certain characters seem more sinister, distraught, or limber, both in the face and in the different areas of the body. Once again, please take a look at the splash page provided (up above), because at a glance you can tell how Barry and Wally are both feeling inside from their body language alone: Anger, for Wally; and pensive, for Barry. 4) Something else that's showcased in the aforementioned splash page is the way he draws energy. 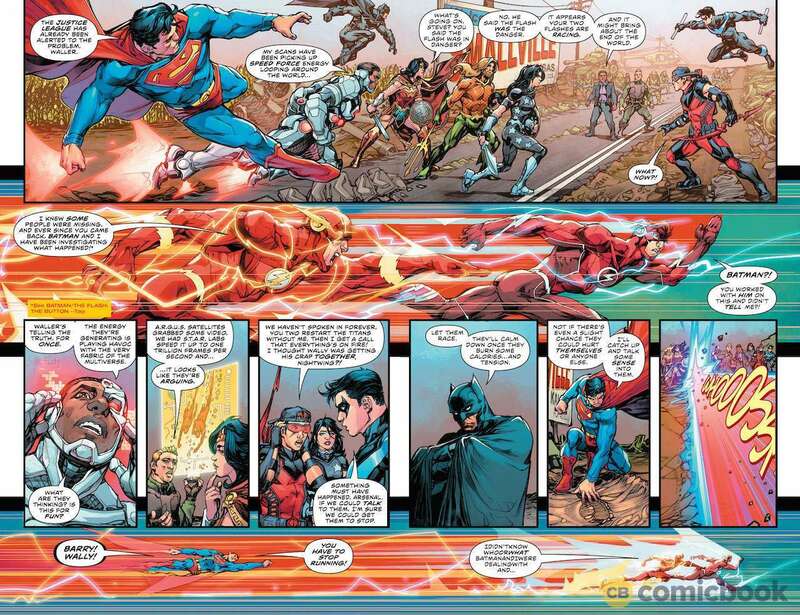 You know; those speed-force swills that twirl about whenever someone is running, punching, or generally in motion. Which trust me, isn't an easy thing to draw, because you don’t want them to be too distracting, but at the same time, you want them to be visible enough to make some sort of an impact. 5) I also have to congratulate him on the amount of characters he drew in these two issues. 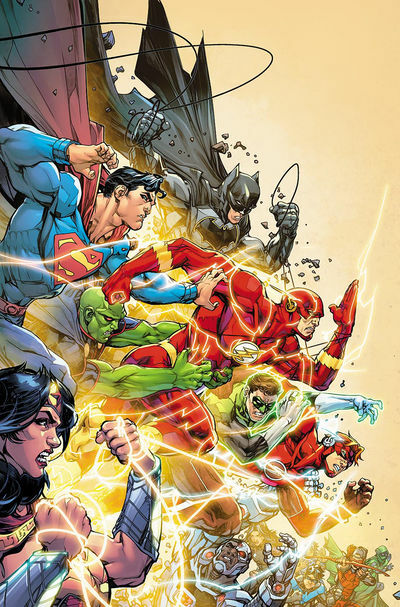 This ranges from the Renegades, Iris, and Wally, in issue 48, as well as Superman, Batman, Wonder Woman, Nightwing, Arsenal, Donna Troy, Aquaman, Green Lantern, Cyborg, Amanda Waller, Steve Trevor, Hawkman, plus others, in issue 49, without forgetting each of the principal heroes and the main villain himself. Well done, Howard. By no means is this an easy thing to do and I truly appreciate the effort. 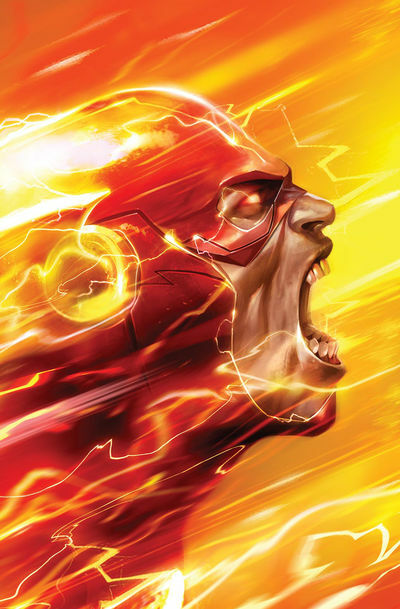 So, overall, these two episodes of The Flash were a pretty decent read. The art was great, the story shows promise, and, touch wood, fingers crossed, the best is yet to come. For some strange reason, I feel compelled to musically match up this adventure with the Flash Gordon theme tune sung by Queen. I’m not sure why though! Maybe it has something to do with him never telling a lie, unlike Zoom, ha! 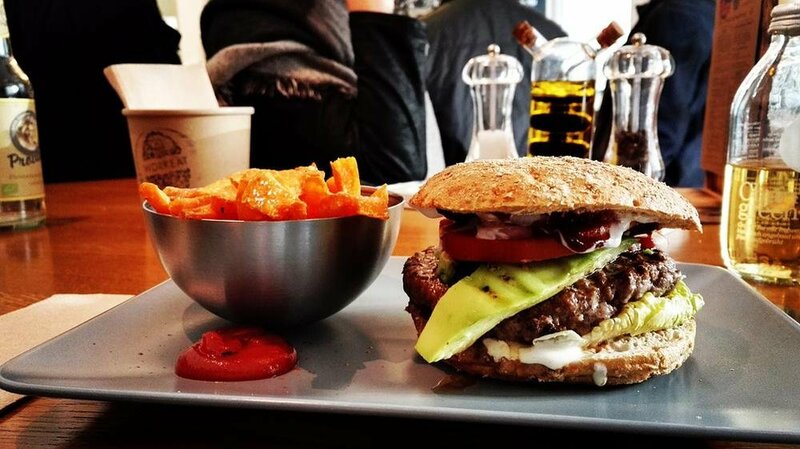 I’m now going to compare these two episodes with fast food because they were quickly served, easy and fun to digest, and basically filled a gap between now and the main course, hint-hint! More string... you can never have enough string.